Manuscript on vellum ownership label “Oliver Buttrick, OCTR. AD 1774” under glass lens (inked vellum under a glass lens is a rare form of decoration seen on only a few other 18th-century powder horns). Very good original condition with original surface, minor cracking and chipping near lip. Two well patinated chips to wood bezel; vertical cracked to glass cover lens. Original wire loops are still present with smooth iron patina. Oliver Buttrick, age eighteen, was one of seven in the Buttrick family to join with other minutemen in this historic conflict. Oliver’s uncle, Major John Buttrick led the advance at the Old North Bridge that day. Oliver was in David Brown’s Company and served alongside his brother William, who was killed three weeks later at Bunker Hill. Fellow minutemen that day included Abiel Buttrick, Daniel Buttrick, Tilly Buttrick, Willard Buttrick and John Buttrick, Jr., a 14-year old fifer. See George Tolman, The Concord Minute Men (1901). The October 1774 date on this evocative powder horn is highly significant. Unrest in the colonies dating to the 1760s had increased with British occupation and seizure of political power, and by 1774 rebellion was at a fever pitch. In October military governor Thomas Gage dissolved the Massachusetts Provincial Congress. Led by John Hancock, the now extralegal body nonetheless met, assuming control of the province outside of Boston, collecting taxes, raising a militia, and authorizing the procurement of arms. 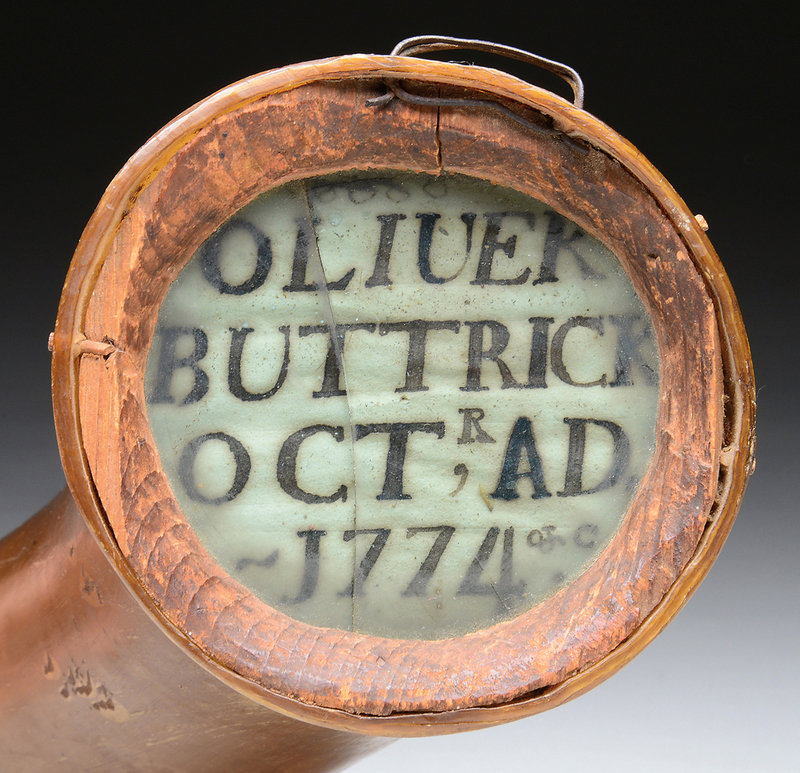 That very month 17-year-old Oliver Buttrick marked his ownership of this powder horn, which was to be used to defend his countrymen the following April. This is a once-in-a-lifetime opportunity to acquire an iconic object from the birth of our nation. This powder horn is among the few existing objects that can be directly associated with the first battle for American independence. This is believed to be the only colonial horn used at this historic confrontation to ever be offered for sale. We are aware of no other object used by a minuteman at the Battle of Concord being sold at auction in many years. The Buttrick family of Concord dates to William Buttrick’s arrival from England in 1635. Minuteman Oliver Buttrick was born in Concord, Massachusetts, on March 7, 1757, the son of Samuel and Elizabeth Buttrick (Concord, Massachusetts Births, Marriages, and Deaths 1635-1850 (1895), p. 209). His siblings were William (b. July 13, 1754), Marcy (b. October 10, 1775), Amos (b. April 27, 1758), and a child who was born and who died on January 22, 1761. In addition to answering the call to action at the Old North Bridge, Oliver Buttrick served extensively in the American Revolutionary War, enlisting in the militia on June 6, 1776. He fought under the command of three of the men with whom he fought on April 19, 1775: Sgt. Abishai Brown, Capt. James Barrett and Capt. George Minot. Buttrick fought in such celebrated arenas as Point Shirley, Bennington, Ticonderoga, Fishkills, and Soldiers Fortune (near West Point). He also served at Boston area forts and performed guard duty on a prison ship in Boston Harbor. See Buttrick pension application and Massachusetts Soldiers and Sailors of the Revolutionary War (1896), p. 973. On March 30, 1786, Oliver Buttrick married Sarah Hall from Ashby, Massachusetts, 28 miles from Concord. The two lived much of their lives in Pelham, New Hampshire, where their children were born and raised. In 1834, at age 77, Oliver Buttrick filed for his Revolutionary War pension, declaring that when he officially entered into the service of his country he was 5′ 11″, age 21, and living in Concord. Corroborated by testimony from various parties, the pension application was approved in December 1834. 2. James P. Hughes, Windham, New Hampshire, before 1883. “James P. Hughes has an old powder horn marked October 1774. It was the property of Oliver Buttrick of Pelham” (Morrison, History of Windham in New Hampshire 1719-1883 (Boston, 1883), p. 192). 4. James D. Julia auction, February 3-5, 2016, lot 2026.